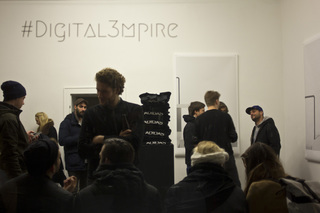 Digital3mpire takes a deep dive into the aesthetics of the rising global digital empire. The gallery consists of a blog, the INTERNATIONAL OFFICE FOR AESTHETIC CONSULTING AND DIGITAL ISSUES, and a projectspace-gallery called THE HUB. Digital3mpire is also a node in a global network of places and platforms dealing with similar themes. The aim of the project is to collect ideas and strategies for connecting the digital and the natural sphere in an intelligent, accessible, and humane way. We work on both the daunting problems and vast opportunities of an increasingly digitally formed synthetic reality. The digital is real but always unfinished and formless. We are aware of its wild and unpredictable nature, but we are looking for the best algorithms and structures to shape it. Eveybody is welcome to join on this journey.